I salute all women who are career oriented. I have my high regards on their will to work and earn a living on their own. But I know too for a fact how excruciating it is to balance career and personal life. 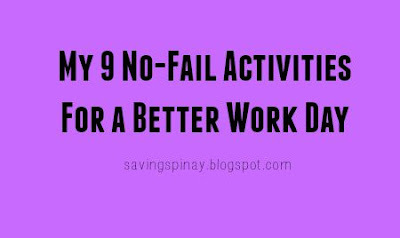 So to all the Juana out there, here are My 9 No-Fail Activities For a Better Work Day that will make you feel better. It all starts with a perfect morning routine. I personally love the idea of having routines to live by. It gives you something to look forward to. Your morning routine can include a skincare routine, productivity routine, workout routine and even a makeup routine just as long as it gives you a nice primer before you head out the door and start working. Checking your emails first thing in the morning is actually proven to decrease your productivity. Spending all your time in the morning reading email is a major waste of time. Unless it is urgent, avoid opening your inbox as soon as you get in your desk area. I am guilty as charged of not having a proper breakfast and just relying on coffee. Later did I realize that whenever I skip breakfast I am easily stressed and distracted at work. Remember to eat and healthy and balanced diet. A perfect to do list will give you a better outline on what needs to get done on a daily basis. Try to keep at least 7-10 important tasks you need to accomplish and have this list as your basis during the day. Reward yourself at times when you have done a great job also you can track on your progress. One thing I look forward in my workday is my one cup of coffee tradition by 3pm. I feel so pumped up just seeping my coffee while listening to my favorite playlists in Spotify. It is also better to maximize your lunch break by taking a power nap or watching a movie that will get you inspired. I always bring a book with me wherever I go. I read mostly in the morning as I commute to work since I ride an FX going to Ayala. I also try to check and to read other blogs that interest me via Flip. Make sure to make everyday an opportunity to learn something new. Listen to podcast, talk to your workmate and visit places that can boost your confidence. Once you become a regular employee you are entitled to the benefit of a Vacation Leave. Use your VL’s wisely and try to travel or cross out one of your bucket list. A quick exercise in the morning can help boost your energy all day long. You can search for the perfect exercise via Google that will suit your need. I try to follow the morning part of my Balik Alindog Program. If ever I run out of time in the morning I see to it that I still do some head to toe stretch instead. We all know how the busy schedule can make rob our time with God. But it should be the opposite. The more your life get busy, the more you need to spend time with God for He is the only provider of the blessings you receive. Read your bible and do some morning devotional that will surely align your day right. I hope these nine activities inspire you to set your workday right. Remember to work hard, save and invest so that someday all your hard work will pay off. Did you enjoy reading this post? Do you have other recommended activities that can boost productivity in the work day? 5 Ways You Can Save More Time in Your Life – New! 30 Do’s and Don’ts of a Successful Person – New! 5 Time Management Apps You Need to Download – New! St. Peter Life Plan: Is it Worth the Investment? – New!